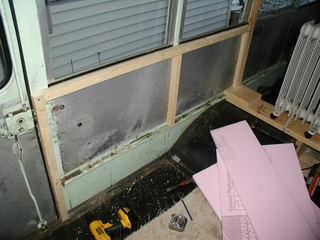 These windows will be covered by interior walls so I cleaned them with alcohol and painted then flat black. After the paint dried I sealed them with GE Silicone II. 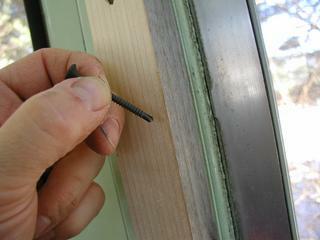 I used 1 5/8" self drilling screws to attached the furring strips. 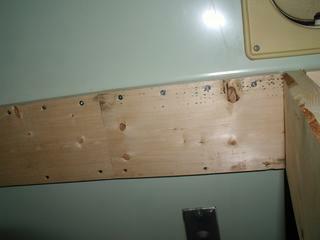 I pre-drilled the wood and used a low speed to drill the screw into the metal, bus steel seems a little tougher then your average mild steel. 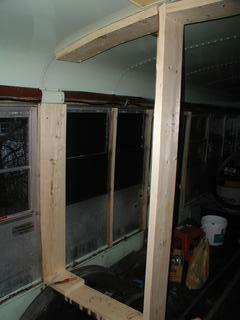 Here's the first frame going into what will be the "Bunk Room". To attach the top of the frame I took out every other screw in the joint between two ceiling panels and drilled a piece of lumber to accept (4) #10 x 2" screws. I drilled a 1/4" deep by 1/2" diameter pocket between the through holes so the wood would sit flat over the remaining screw heads. At the peak of the roof I used #10 x 3" screw to bridge the gap between the door header and the ceiling. 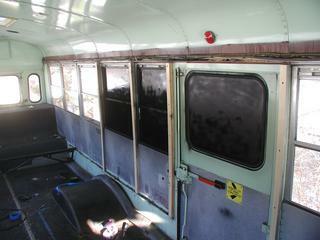 I used 1" insulating foam to cover the blacked out windows. I trimmed the foam around the door hardware and used GE Silicone II to glue the bits of foam in place. I think I'll used construction adhesive in the future for this as it is cheaper. It quickly became clear that I need to organize my work area a little better so I built a bench from some of the kitchen cabinets I've been collecting. I thought I'd be kind to the neighbors and get the big yellow bus under cover. 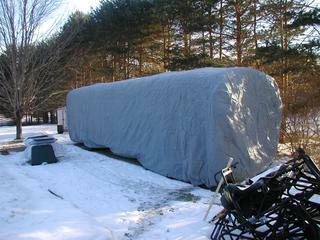 This is a 37' RV cover from Northern Tool. The seat frames will go to the dump this weekend, though I'll keep a few for random bits of steel and to form the skeleton of the dinette. 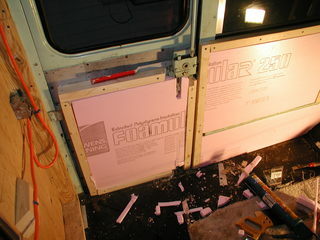 Here are some shots of the paneling going into the bunk room, the surface of the door is about an inch deeper then the wall so I used two layers of foam on it. 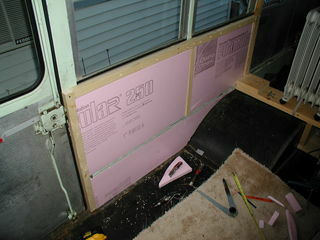 Strapping up, and foam panels in. 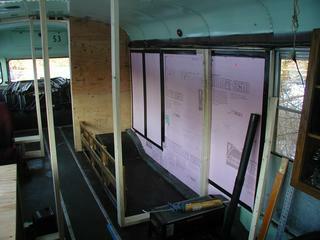 When you panel your partitions you'll need to fit the material to the curves of the bus. You can scribe your paneling in each time you fit a piece, but it's better to make a template so you only do the fiddly bits once. 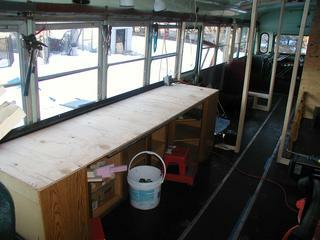 template is about 2'x3' and is just the curvy bit of the bus. Draw horizontal lines across the piece of poster board with 1/2" spacings. Mount the poster board on some sort of frame in the bus, a partially built wall like those above works well. 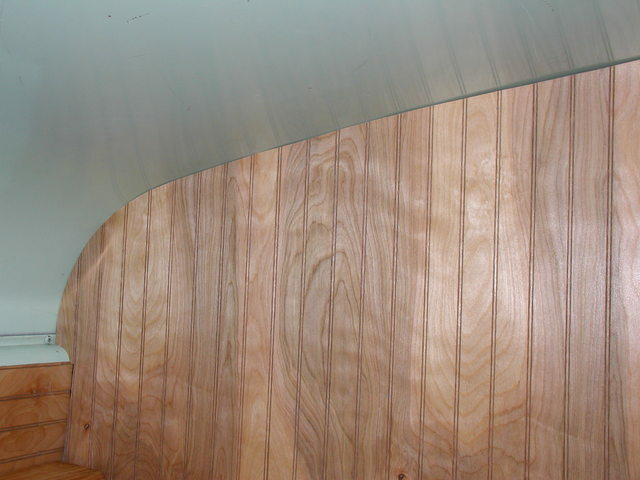 The upper left corner of the board should be positioned a couple of feet from the wall. Now starting at the lower left, measure the distance to the poster board - remember that number. Move up one line and mark the board at the same distance. Move up another line and do it again. Where you have really curvy bits you may want to double up the number of horizontal lines to more accurately trace the contour. 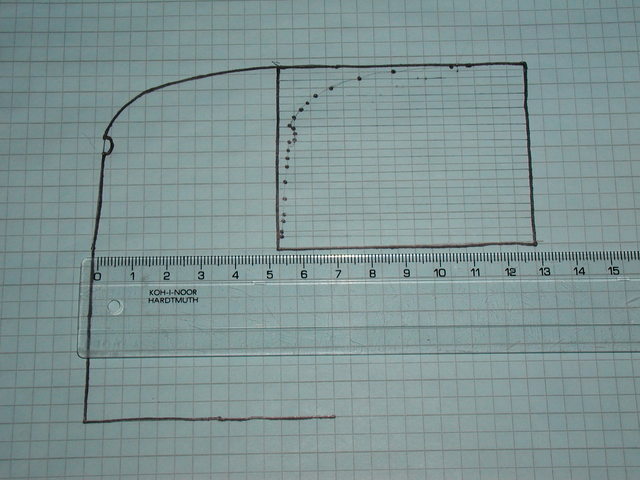 Sketch the points together and cut out the template, see how it fits. Mark where it doesn't fit and use those marks to copy the corrected shape to another piece of poster board, repeat until the fit is perfect. 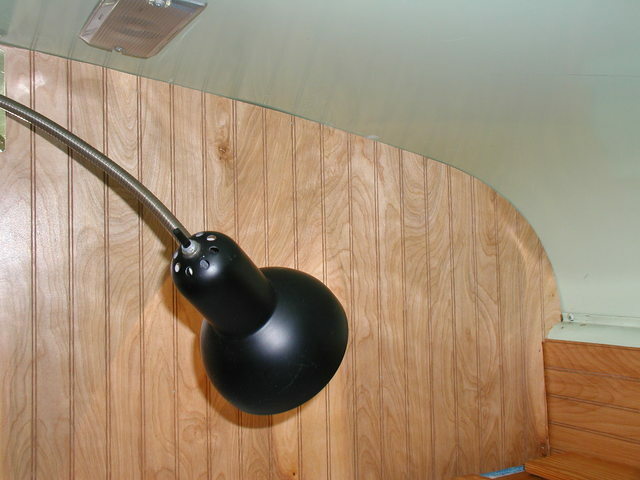 Here is what the fitted panels look like, you can see there are some slight gaps but these are more due to waves in the steel of the ceiling then in the contours of my panels.